Sir Cliff Richard appears set to lose a battle to extend the number of years that musicians can receive royalties for their records, the BBC has learned. He wants copyright to last 95 years, rather than the present 50 years. But an independent review is to recommend the terms are not extended, a well-placed government source has said. This outcome would mean the report had "missed a great opportunity" to support the music industry, the chairman of the British Phonographic Industry claimed. "There can be no rationale for discriminating against performing artists - a vital part of the creative mix," said Peter Jamieson. "Nor can it be possible to justify disadvantaging Britain and Europe in the global music market. "The sound recording is as important a copyright as musical composition and film, and deserves a similar lifespan." 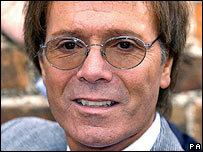 If the findings of the report, commissioned by the Treasury, were backed by the government, Sir Cliff's earliest tracks would start to come out of copyright in 2008. His first big hit was Move It, recorded in 1958, when he was hailed as the British Elvis. 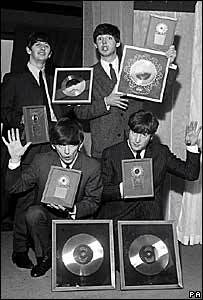 The Beatles would also be in a similar situation from 2012, the 50th anniversary of their first hit single, Love Me Do. Music journalist Neil McCormack told BBC Radio Five Live that this outcome would be a blow to the industry. "This was set before the advent, the big boom, of rock 'n' roll - the boom in popular culture which has led to a whole vast number of people making their living from these royalties. "You can make a record in 1955 and have been getting royalties," he said. "Suddenly they're gone." John Kennedy, the chairman of the International Federation of the Phonographic Industry, predicted the Treasury would be forced to decide "whether or not it wants to support one of its successful industries". "If the UK government decides not to support copyright equalisation, then the music industry will have to continue its campaign in Europe," he said. "There, the signs are encouraging, but there is no doubt that there will be raised eyebrows." People would ask why Europe should help the music industry when the government of the "most important music market in Europe" had decided not to, Mr Kennedy added. The situation applies only to recording artists as composers and their families retain copyright on musical scores until 70 years after the author's death. The copyright review was conducted for Chancellor Gordon Brown by Andrew Gowers, a former editor of the Financial Times. His conclusions will be published next week, as part of the chancellor's annual pre-budget report, the BBC's business editor Robert Peston says.